North Korean leader Kim Jong-un's sister Kim Yo-jong looks set for much more public exposure than she's used to, despite being a member of the country's ruling elite. She will be the most senior member of the Kim family to ever visit the South when she attends the Winter Olympics in Pyeongchang later this week. Part of the high-level delegation sent by Pyongyang, Ms Kim is the younger sister of the North Korean leader and a close adviser. As recently as October 2017, Ms Kim had seen her role significantly strengthened by being promoted to the powerful politburo. She was already influential as vice-director of the propaganda and agitation department and had replaced her aunt as a member of the country's top decision-making body. Ms Kim has been on the US sanctions list for a year over alleged links to human rights abuses in North Korea. That means US citizens are prohibited from conducting any transactions with her. Any property and assets in the US would be frozen. Ms Kim has been described as having a sweet, good-natured disposition, with a bit of a tomboy streak in her, North Korea leadership expert Michael Madden told the BBC. But reports say she has also had a sheltered upbringing, and other members of the Kim family have not interacted with her much. School officials in Switzerland have said she was over-protected by the coterie of guards and caretakers - she once reportedly had a mild cold and was immediately pulled from school and taken to hospital. Where does she fit in the ruling family? Kim Yo-jong is the youngest daughter of late leader Kim Jong-il, and shares the same mother as Kim Jong-un and brother Kim Jong-chol, according to North Korea Leadership Watch, a website run by Michael Madden. Born in 1987, she is said to be very close to Kim Jong-un, who is four years older than her. The two of them lived and studied in Berne, Switzerland at the same time. She is reportedly married to the son of Choe Ryong-hae, the powerful party secretary. Before joining the politburo, Kim Yo-jong's main job has been to protect her brother's image, taking up a key role in the party's propaganda department in 2014. She is said to have managed all his public appearances as well as acting as a political adviser. She has sporadically been in the spotlight in recent years, appearing at the state funeral of her father in 2011 and the election of her brother in 2014. 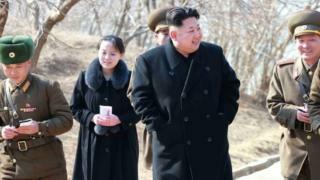 Ms Kim has occasionally been seen with her brother in state media pictures. In October 2015 she was rumoured to have been sacked from the propaganda department by Mr Kim for doing a poor job. But a top job in the leadership is thought to have been carved out for her as early as 2008 during succession planning as Kim Jong-il's health deteriorated. There was even speculation she might be a candidate, albeit an unlikely one, to take over from her brother after he disappeared from public view for a prolonged period in 2014. When Ms Kim was given a key post at the country's rare ruling party congress in 2016, it was widely expected that she would soon take up an important role in the politburo.